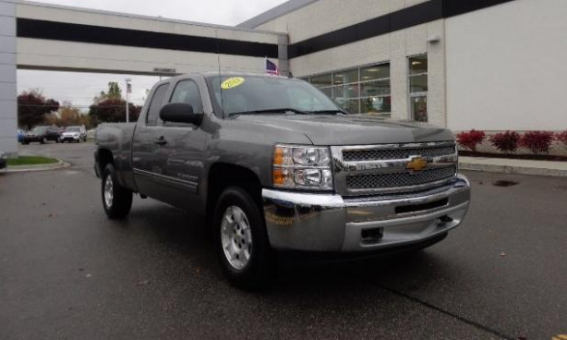 2013 Chevrolet Silverado 1500 LT!! EXT CAB!! CERTIFIED WITH ALL STAR PACKAGE!! Heavy-Duty Trailering Package (Retail) (Heavy-Duty Rear Automatic Locking Differential), 17" x 7.5" 5-Spoke Aluminum Wheels, 4WD, 6-Speed Automatic Electronic with Overdrive, All-Star Edition, BluetoothÂ® For Phone, Dual-Zone Automatic Climate Control, EZ-Lift Tailgate, GM Certified, Light Titanium/Dark Titanium w/Premium Cloth Seat Trim, Locking Tailgate, and Steering Wheel Mounted Audio Controls. GM Certified Pre-Owned means you not only get the reassurance of a 12mo/12,000-Mile Bumper-to-Bumper limited warranty, but also a 2yr/24,000-Mile Standard CPO Maintenance Plan, up to a 5-Year/100,000-Mile, $0 Deductible, Fully Transferable, Powertrain Limited Warranty, a 172-point inspection/reconditioning, 24/7 roadside assistance, Courtesy Transportation, 3-Day/150-Mile Customer Satisfaction Guarantee, 3 month trial OnStar Directions & Connections Service if available, SiriusXM Radio 3mo trial if available, and a vehicle history report.